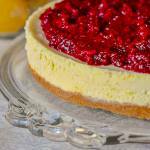 Lemon Raspberry Cheesecake. A silky smooth lemon cheesecake with just the right tangy lemon flavour topped by a complimentary sweet raspberry compote. This was one of the desserts that I served to my guests at Christmas dinner this year. The flavours of lemon and raspberry were very good together and were appreciated by all who sampled it. This would make a terrific New Year’s dinner dessert too and may just make a repeat appearance on my table. I bake my cheesecakes in a 9 or 10 inch springform pan that has the bottom and sides wrapped in multiple layers of wide heavy duty aluminum foil which forms a sort of boat that the cheesecake pan sits in. The roll of aluminum foil that I use is about 16 inches wide. 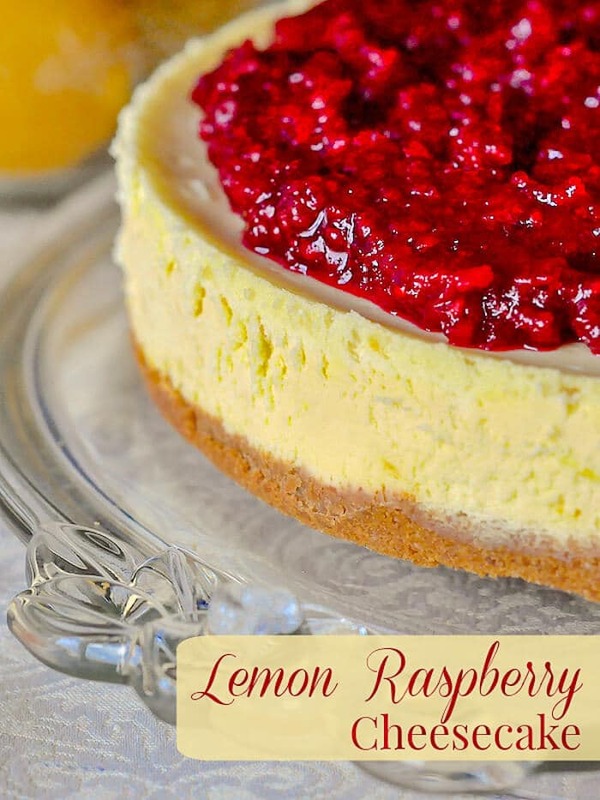 Like this Lemon Raspberry Cheesecake recipe? Lemon Raspberry Cheesecake - a silky smooth lemon cheesecake with just the right tangy lemon flavour topped by a complementary sweet raspberry compote. In a small bowl combine the graham cracker crumbs, sugar and melted butter. Press the crumb mixture into the bottom of a lightly greased or parchment lined 9 inch spring form pan. (Grease bottom only!) Parchment paper is ideal here because it makes it very easy to release the cheesecake from the bottom of the pan. Cream together the cream cheese and sugar for 2 to 3 minutes until well combined. Beat in the vanilla extract and lemon zest. Finally blend in the whipping cream well until the batter is very smooth. Using a rubber bowl scraper/spatula, scrape the bottom and the sides of the bowl as well as the electric beaters/paddle and give the batter a final beating for 1 minute on a higher speed. This final step ensures that there are no lumps in the batter and introduces a little air into the cheesecake to make it lighter. Pour over the prepared base and bake in a bain marie at 300 degrees F for 65-75 minutes. (Oven temperatures will vary slightly. Mine takes the full 70 minutes and you can go to 75 if you feel you need to. Even longer as the water bath is protecting the cheesecake). Don't be an compulsive oven door opener! Don't open it at all in the first hour. The cheesecake does not have to brown at all in order to be fully baked; the surface of the cheesecake should lose any shine when the cake is properly baked. It can still be slightly wobbly just at the center at this point. Allow the cake to cool to room temperature before moving it to the fridge to chill completely. Slowly simmer the berries and sugar over low heat for about 10 minutes. Dissolve the corn starch in the water and slowly pour into the boiling berries stirring constantly until thickened. Cool completely before adding the compote to the top of the cooled cheesecake. In my opinion, baking the perfect cheesecake requires the use of a bain marie during baking. A bain marie is simply a water bath that buffers the direct heat from the sides and bottom of the baking pan to more evenly bake the cheesecake from the sides to the center. I bake my cheesecakes in a 9 inch spring form pan that has the bottom and sides wrapped in multiple layers of wide heavy duty aluminum foil which forms a sort of boat that the cheesecake pan sits in. The roll of aluminum foil that I use is about 16 inches wide. I use at least 4 layers of foil to make sure that no water leaks in and ruins the crust of my cheesecake. Wrapping the bottom of the pan in plastic wrap before the foil is added is also a good idea. The temperature doesn't get hot enough to melt it and it doesn't come into contact with the cheesecake anyway. The aluminum foil wrapped pan is then placed inside a larger baking pan; I use a 12 inch cake pan. Boiling water is then poured into the larger pan filling it from ½ to ⅔ of the way to the top.I find it best to pour the boiling water into the pan after it is placed on the rack in the oven as you are less likely to splash water onto the cheesecake or inside the aluminum foil. I reuse the aluminum foil for several future cheesecakes, adding a couple of layers to it each time just to be safe. EVEN IF YOU CHOOSE NOT USE A BAIN MARIE still use the aluminum foil wrap around the cheesecake pan. The aluminum foil still offers a good buffer to the heat. High heat and baking too quickly is the main reason that a cheesecake becomes dense and not creamy. Oh man how good does this cheesecake look?! This is definitely a winner. Attempted this recipe. All was great until after nearly 2 hrs of cooking it still wasn’t done. I used an 8 inch pan which may have had something to do with it, but it seems that after 2 hrs it should have cooked. I also found that the aluminum foil did not keep the water out completely. I have not made many cheesecakes, the ones I have baked I didn’t use water. Any thoughts or suggestions of what I might have done wrong. I don’t understand how you would fit this cake into an 8 inch pan. If this was not cooked in 2 hours, I would begin to question the actual accuracy of your oven temperature. I always use heavy duty foil in several layers to prevent leakage. B. Made this cheesecake and received many compliments on it. I had to leave it in the oven for 20 more minutes though. This recipe is a keeper! I love your recipes and this cheesecake looks delicious! I have had trouble with the water leaking into my cheesecake in the past when using aluminum foil, and have found that folding down an oven baking bag (such as one used to roast a turkey) has worked well. It has remained water tight and I haven’t had problems with condensation either.